Your Audi Can Now 'Talk' With Traffic Lights In Washington D.C.
Few automakers have pursued technology that allows cars to communicate with surrounding road infrastructure like Audi. On Wednesday, the automaker announced the latest development in its Traffic Light Information system, which lets select models communicate with traffic signals, saying it’s now available for use in the nation’s capital. More than 600 intersections in Washington D.C. will support Audi’s vehicle-to-infrastructure (V2I) technology on select 2017 and 2018 models. D.C. is the seventh city to implement the technology, following Dallas, Houston, and Denver. It wasn’t immediately clear what models will support the features, but when Audi first announced the technology would be introduced in 2016 in Las Vegas, the automaker said it would be available on A4 and Q7 all-road models. The automaker said on Wednesday the system’s available to drivers with the Audi Connect PRIME subscription. 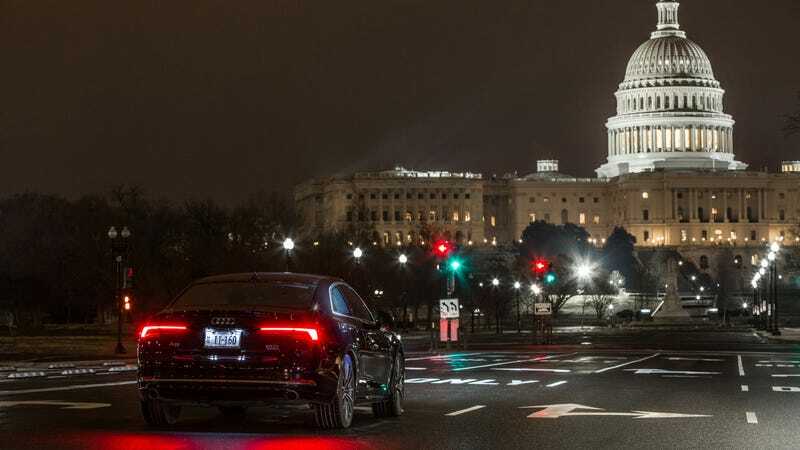 Now, Audis in D.C. will be able to receive information from a centralized traffic management system, like a “time-to-green” feature, which offers exactly what you’d expect: how much time until a red light will turn green. With D.C. in the mix, Audi says the Traffic Light Information system is now available at 1,600 intersections across the U.S. In the future, Audi envisions V2I technology being integrated into the vehicle’s start-stop function and optimized navigation routing, saying these tools are aimed at reducing congestion on roadways. Another potential benefit? It’ll surely alleviate stress for any driver who’s trying to, say, eat a burger and fries while driving. That is, if you’re cool with eating in your car.